Standing while you work has never been so comfortable. Enjoy the superior blend of comfort and style with Chef Gear mats, enhanced with Bounce Comfort technology. These extra thick memory foam mats are made to last. Standing for long periods of time can take its toll on your back and feet, affecting your overall health. Place the Chef Gear comfort mat where you stand most and enjoy continuous relief. 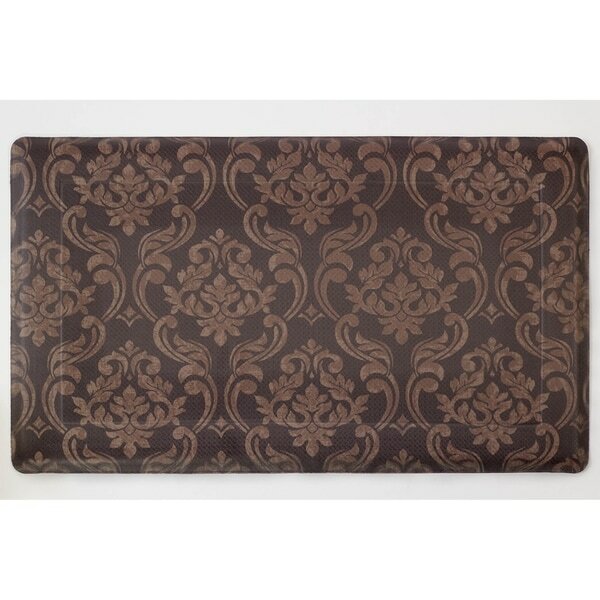 The classic Chain Damask design adds decorative style to any kitchen or workspace. Each mat is constructed for easy moving and cleaning, with a non-slip surface and non-skid bottom for safety. Durable memory foam provides stain and tear resistance for years of use. Beveled, anti-trip edges finish off each mat. Available in 18 x 30 in. and 24 x 36 in. 100% PVC. Imported. Available in 18 x 30 in. and 24 x 36 in. Exact Size: 1'5" x 2'5"
If you’re purchasing this mat for a kitchen on a boat or tour bus then the look and quality are ok. However, most people wouldn’t like the look or comfort level in a main kitchen. I purchased two for a laundry room exit door and sink area. For this purpose the look and comforts fine. 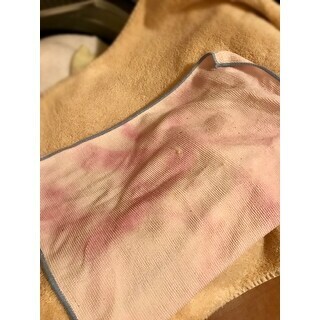 However, I spent 20-40 minutes wiping, then rinsing and wiping again, to get a pink residue off both mats entire surface and edges. I was wiping them after unpacking assuming there'd be packing dust and was surprised to see the pink residue coming off these brown mats. I knew my hands felt like there was a film on them but thought it was the plastic wrapping I had removed. In short, if your going to purchase, wipe clean so the pink ‘residue’ isn’t transferred to carpet, kids or pets. I’m assuming it’s a chemical of some kind. The images I’ve attached are after a final rinse. Hope this helps. These are so good I've ordered 1 more! To help fatigue in legs and feet.